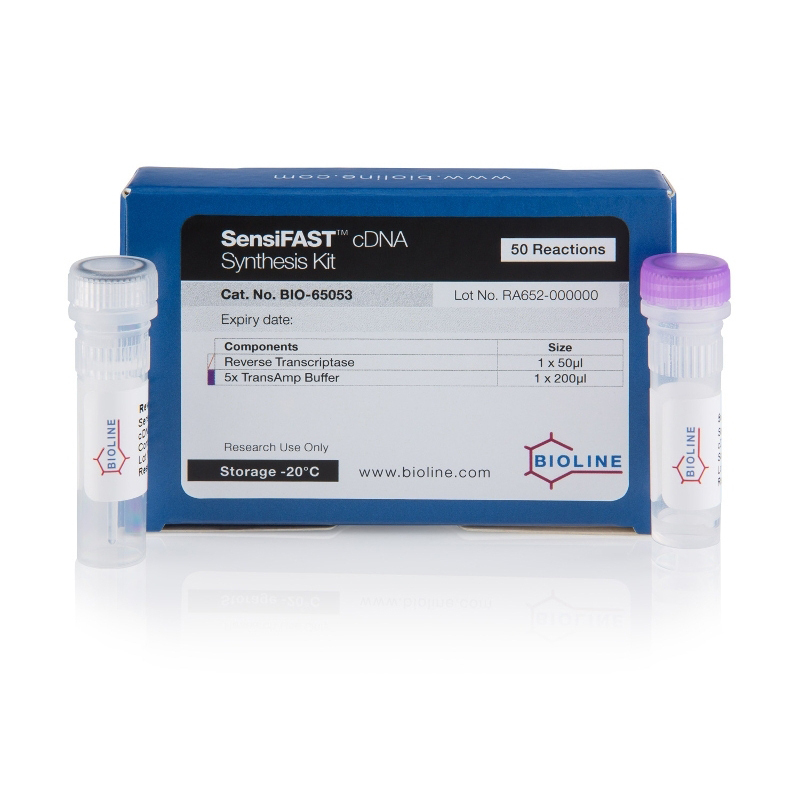 To complement the SensiFAST™ Probe and SYBR® kits, Bioline has developed the SensiFAST™ cDNA Synthesis Kit to provide a rapid and sensitive method for first-strand cDNA synthesis. The SensiFAST™ cDNA Synthesis Kit displays excellent linearity across a wide range of starting material, revealing the same relative representation in cDNA templates, regardless of gene abundance, making it excellent for use in real-time PCR studies. A novel, highly-pure reverse transcriptase and new TransAmp™ buffer system delivers highly-efficient synthesis of cDNA, enhanced reproducibility and data accuracy. These features make the SensiFAST™ cDNA Synthesis Kit ideal for working with limited samples, such as laser-micro dissected samples and tissue biopsies. The TransAmp Buffer also employs a unique blend of random hexamer primers and anchored oligo dT to ensure unbiased 3’ and 5’ coverage and reverse transcription of all regions. Additionally, the SensiFAST™ cDNA Synthesis Kit can be used with SensiFAST™ Probe and SYBR® Kits for fast real-time RT-PCR without compromising quality, with real-time results in less than an hour. "Our Institute consisting of more than 60 active researchers has a longstanding interest in understanding changes to the transcriptional landscape of prostate cancer. Reproducibility, sensitivity and cost-effectiveness are critical parameters in selecting our day-to-day cDNA synthesis kit. This combined with its convenient two reagent system continues to make the SensiFast cDNA synthesis kit stand out from its competitors and our preference for almost two years."